Where to start? 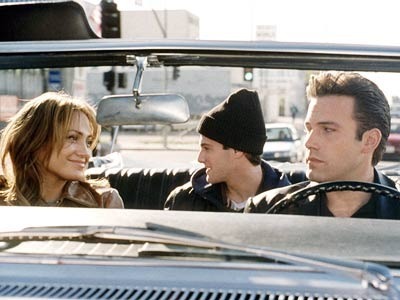 With the fact this movie is apparently a vehicle to prove Ben Affleck has the power to turn gay women (in particular Jennifer Lopez who stars as Ricki) straight? With the fact this movie is apparently a vehicle for Jennifer Lopez to show off her outstanding yoga skills while simultaneously speaking raunchy lines about being a lesbian? With the fact, perhaps, that this movie apparently believes it has even one iota of interesting storyline to share with us? Nah, how about we just start and end with the rating noting just how embarrassing this Martin Brest directed stinker of a movie is. With a nod to Justin Bartha who stars as the mentally challenged lad, Brian, and does a good job, there's nothing here to warrant anything but my rating of 0 out of 10. Avoid.